Pasquale, Matthias and Ciro Toscano are reunited with their parents at a hospital. 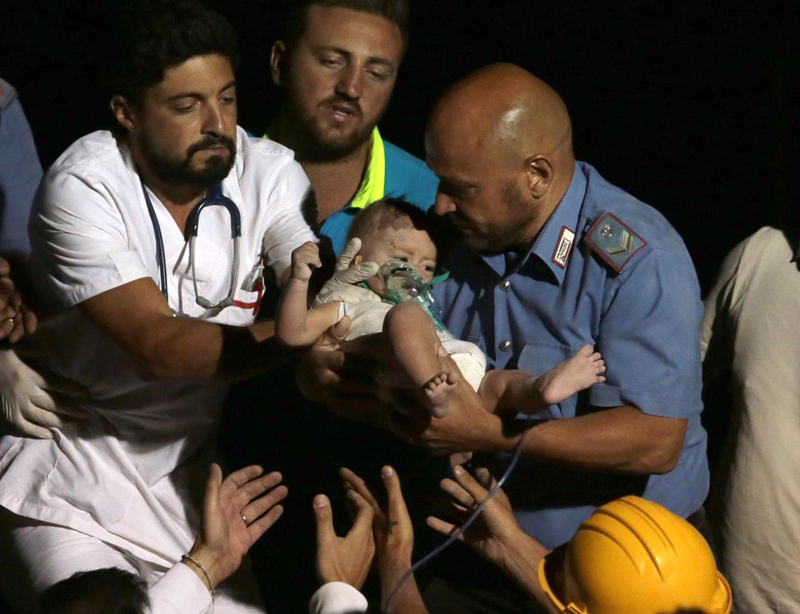 MILAN – Italian firefighters working through the night, sometimes digging by hand, freed a 7-month-old baby Tuesday and then his two older brothers from the rubble of their home that collapsed when a 4.0-magnitude quake struck the resort island of Ischia during the height of tourist season. At least two people were killed in the quake that struck just before 9 p.m. (3 p.m. EDT) Monday, while another 39 were injured and some 2,600 were left homeless. The victims were an elderly woman who struck by masonry that fell from a church, and a second woman who was inside a building that collapsed. 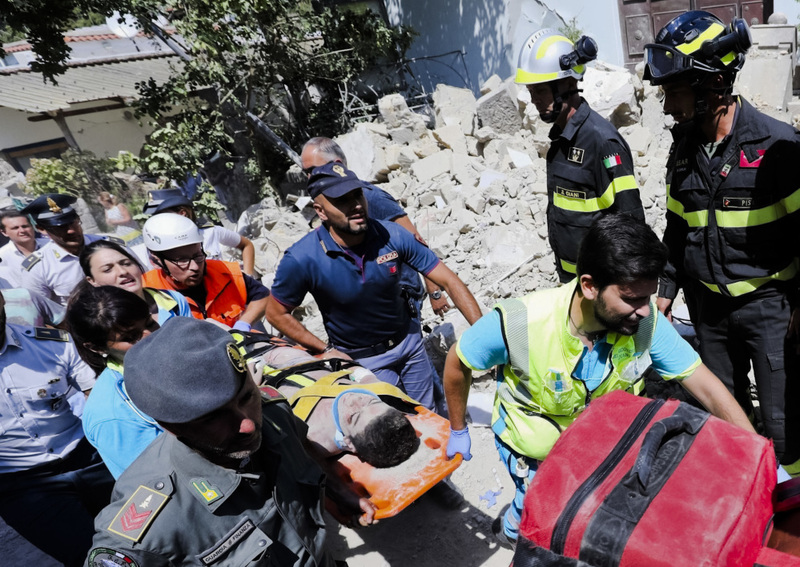 Eleven-year-old Ciro is carried on a stretcher after being rescued from the rubble of a collapsed building in Casamicciola, Italy, a day after a 4.0-magnitude quake hit the Italian resort island, on Tuesday. The children’s parents were waiting for Ciro at the hospital’s emergency room, his mother sitting in a wheelchair next to his father, Alessandro, whose hands were bandaged from a fracture. It wasn’t immediately clear where the family would be staying. “For three children saved from the rubble, we have witnessed a true miracle. They are miraculously healthy,” said Virginia Scarfato, director of the Rizzoli hospital in Ischia. The quake hit during the height of the tourist season, with the island’s population of 64,000 ballooning by another 150,000 at the time the quake struck. Italian television showed many visitors taking refuge in parks and sleeping under blankets in the aftermath while authorities began organizing ferries to bring tourists back to the mainland early Tuesday. Tourism officials said that the damage was localized in two towns, and said much of the island was business as usual Tuesday. According to Ermanno Mennella of the Federablberghi hoteliers association in Ischia, just 10 of the island’s 310 hotels had been impacted by the quake and only three or four were closed by it. Fabrizio Pistolesi, the head of Italy’s national architecture advisory board, told SKY that many buildings on the island were built before seismic codes were adopted. He also cited the high incidence of illegal construction on Ischia and generally in the Campagna region that includes both the resort island and Naples. “We know well that in Campagna, more than 200,000 homes were illegally constructed, we are talking about homes constructed in absolute scorn of seismic norms,” he told Sky TG24. The head of Italy’s Civil Protection Agency, Angelo Borrelli, told reporters that 2,000 people had been left homeless in Casamicciola and another 600 in the towns of Lacco Ameno and Ischia. He said authorities were checking the stability of hotels to see if they could be used as temporary housing.